Japan Agency for Marine-Earth Science and Technology (JAMSTEC) was inaugurated in 2004, as one of the independent administrative institutions upon re-organized from its former organization, Japan Marine Science and Technology Centre. In addition JAMSTEC is handling many projects with international collaboration. Natsushima has an aft wheelhouse that allows the vessel to be piloted while at the same time deploying and recovering Hyper-Dolphin from the rear section of the vessel. Natsushima was built in 1981. Ship is 67 m long;draft 3.8 m; cruising speed 12 knots; Diesel propulsion with CPP. 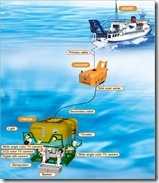 Independent oceanographic surveys, and installation and collection of seismometers, mooring systems, etc. The support ship Yokosuka performs surveys of the deep-sea bottom by acting as a support ship for SHINKAI 6500, a large submersible research vehicle. SHINKAI 6500 is capable of diving to a maximum depth of 6,500 m in the world. Ship is 105 m long;draft 4.7 m; cruising speed 16 knots; Diesel Propulsion with CPP. A large vessel able to perform observational studies over wide areas under rough weather conditions, Mirai is one of the largest class of research vessels in the world. Converted from the former nuclear powered ship, Mutsu. The vessel’s reactor was removed in 1995, non-reusable parts were dismantled and asbestos removed, and in 1996 the vessel was reborn as Mirai. Ship is 128 m long;draft 6.9 m; cruising speed 16 knots; Electrical Propulsion with CPP. The deep sea research ship Kairei conducts surveys of seabeds in trench areas by acting as the support ship for the deep sea ROV, KAIKO 7000, which can conduct surveys up to a maximum depth of 7,000 m. Ship is 104 m long;draft 4.5 m; cruising speed 16 knots; Diesel Propulsion with CPP. 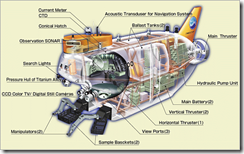 Deployment and collection of ocean seismometers, mooring systems, etc. Hakuho Maru was transferred from the University of Tokyo’s Ocean Research Institute together with Tansei Maru in 2004, coinciding with the inauguration of JAMSTEC as an independently administered institution. HAKUHO MARU is a large-scale research vessel equipped with various research laboratories and observational equipments including winches. The vessel is able to conduct long-term, long-range, multipurpose research cruises around the world, in both coastal and offshore waters including those in the polar regions. Ship is 100 m long;draft 6.0 m; cruising speed 16 knots; Electrical Propulsion with CPP. Tansei Maru was transferred from the University of Tokyo’s Ocean Research Institute in 2004, coinciding with the inauguration of JAMSTEC as an independently administered institution. The vessel is employed in a wide range of fundamental ocean research operations, mainly in the seas surrounding Japan, including Sagami Bay, Suruga Bay, Kumano-nada, and off Sanriku. Ship is 51 m long;draft 3.7 m; cruising speed 13 knots; Diesel Propulsion. SHINKAI 6500 is a manned submersible that can dive up to a depth of 6,500 m. The vessel currently has the greatest depth range of any manned research vehicle in the world. SHINKAI 6500 was completed in 1990, and in 2007, it completed its 1000th dive. The vessel studies topography and geology of the seafloor and is studied organisms that inhabit in the deep sea of Pacific Ocean, Atlantic Ocean, Indian Ocean in addition to Japan Sea. Completed in July 2005, the deep sea drilling vessel, Chikyu, features the most advanced drilling capabilities in the world (7,000 m below the seafloor). With these capabilities, Chikyu allows drilling of the previously unreachable mantle as well as the seismogenic zone. Acting as the principal vessel of the Integrated Ocean Drilling Program (IODP), the main objective of Chikyu is to facilitate a wide range of activities that once achieved will contribute to the future of humankind. These activities may include revealing the mechanism to develop the giant earthquake, the origins of life, future global environmental changes, and new deep sea resources. Ship is 210 m long;draft 9.2 m; cruising speed 12 knots; Diesel Electric Propulsion. The deep-sea cruising vessel Urashima is an autonomous deep-sea exploration robot which was developed by JAMSTEC since 1998. The vehicle is able to determine its own location and follow predefined courses configured in its onboard computer. On February 28, 2005 Urashima succeeded to complete the world-record, 317-km continuous cruise. Urashima is able to automatically collect oceanographic data (such as salinity, water temperature and dissolved oxygen) required to clarify the mechanisms of global warming over an extensive areas. The vehicle is also able to cruise along the seafloor in order to acquire extremely high-resolution seafloor topography and sub-bottom structure. The vessel is navigated by program put into its computer, which means that it can perform surveys over a particular fixed location or up and down a defined narrow path or range. Deep Tow is a deep ocean floor survey system that can be outfitted with sonar or cameras and towed through the water at low speeds at the end of a cable measuring several thousand meters in length. There are four systems available: a camera and sonar system in the 4,000 m class, and a camera and sonar system in the 6,000 m class. Hyper Dolphin is a remotely operated vehicle that is able to conduct surveys at a maximum depth of 3,000 m. Equipped with a high-definition TV camera, the vehicle facilitates visual and filmed surveys of the deep sea. Samples from the ocean floor can also be collected using the two manipulators (robot arms) on the vehicle. Uses High Definition TV camera. The images shot by this camera are transformed through a 3,300 m optic fibre cable between the camera of the vehicle and the control room of the controlling ship. Kaiko 7000 unmanned research vessel is a type of launcher vehicle capable of diving to a maximum depth of 7,000 m to perform research. Kaiko was lost during an accident that occurred off Shikoku in May 2003 in which the secondary cable was severed. To replace it, UROV7K, a 7,000 m class optical fibre cable-type remotely operated vehicle, was modified and integrated with Kaiko’s launcher to create the new Kaiko 7000. The ability to dive to a depth of 7,000 m makes this vehicle one of the deepest diving vessels in the world. OldSailor sincerely appreciates JAMSTEC for their outstanding contribution to marine world.